The "Spastics Society of Tamilnadu," in India has a large, well-equipped center in the city of Madras. It also has an outreach program to rural areas, where most people are quite poor. Families there have few resources to build aids and equipment for their disabled children. They make their houses of mud with palm-leaf roofs. There is almost no furniture: people cook, sit, and sleep on the earth floor. 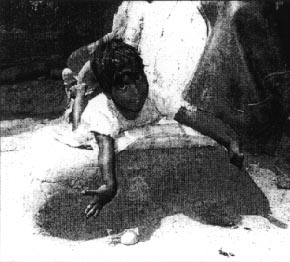 NADU is a little girl in a remote village. She has cerebral palsy, and the rehabilitation workers visited her family's home. Her family fed, dressed, and cared for her lovingly. But Nadu had spent the first five years of her life lying on the floor. Because she could not sit or stand by herself, her parents did not know what else to do. Nadu also had difficulty with speech. Mentally, she seemed a little slow. Part of her developmental delay probably came from lying on the floor all day, looking up at the ceiling. The visitors tried sitting Nadu in corners and against walls, but her spastic body and uncontrolled movements soon left her sprawled again on the floor. She needed special seating. However, building materials were scarce, and screws and nails were unavailable. "Here, our main building material is mud," explained Nadu's father. Mud! With suggestions from the visitors, the family made a special seat and other aids out of mud. The mud seat had a pommel made from a thin log (padded with an old cloth) to keep Nadu from slipping forward. Later, they built her a standing frame made from mud. 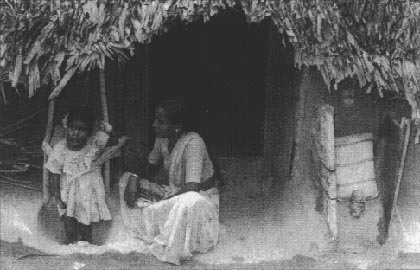 Nadu and her mother at their home. 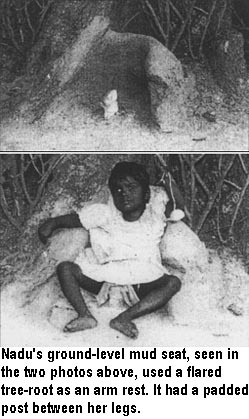 On the left, Nadu stands on her mud standing frame with her feet in a hole in the ground. To experiment with positions that help her stand best, the position and angle of her feet can be adjusted easily (with a trowel). To the right of the door is a special seat made of mud. One side and the back of the seat are both made from scraps of foam-plastic packing crates. The rain storm. Sadly, a few months after Nadu's aids were built, a rain storm turned them into a pool of mud. But the loss was temporary. Soon, her family built new and better mud aids. These included a ground-level seat for sitting with her legs extended. One advantage to aids made of mud is that they must be rebuilt after each rain storm. This provides an opportunity to periodically re-adapt them to meet the child's changing needs. A sloping mud platform was also built by the family for Nadu to lie on. Her head and arms extended over the front edge. This helped her gain better head control, and encouraged her to use her hands to play with objects in front of her. 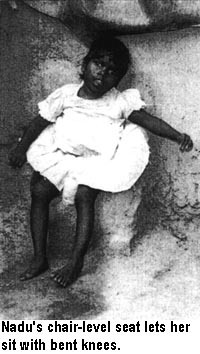 The mud-made equipment for Nadu, while rustic, allowed the girl to sit and stand upright, and to participate more in the world around her. It also gave her family new enthusiasm for working and playing with her. Nadu soon began to speak better, to laugh more, and to take more interest in things around her.